The Impala now offers Apple CarPlay and wireless phone charging. The four-cylinder LTZ has been dropped, leaving the V6 engine as the sole choice for the top-of-the-line model, and the “sueded cloth” upholstery that was optional on last year’s LT model has been replaced by leather. 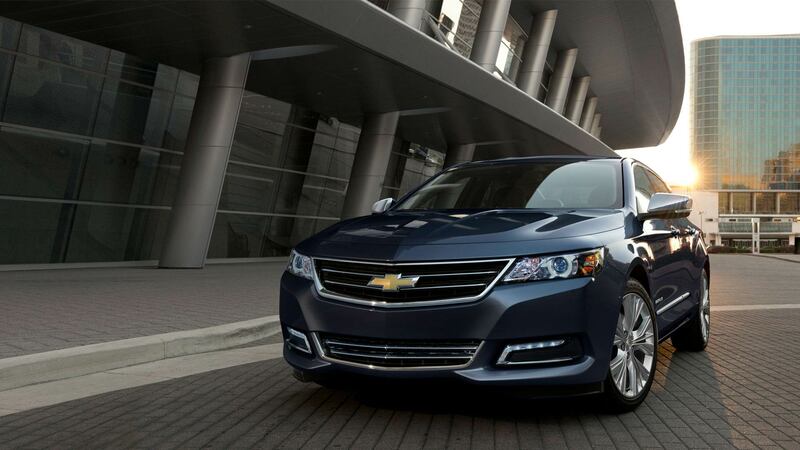 Why are we fans of the 2016 Chevrolet Impala, a large sedan in its third year of production? Well, it certainly has the big-car basics down, what with its roomy interior, smooth ride and trunk large enough to relocate a small village. But we also appreciate the Impala’s technology, particularly relative to what the previous, rental-grade Impala provided. Standard on all but the base LS trim is the 8-inch MyLink touchscreen infotainment system, which has crisp graphics and an intuitive interface, albeit one that can occasionally be slow to respond. The Impala is up to date on electronic driver aids, too, with lane-departure warning, forward collision alert and blind-spot monitoring all present and accounted for on the options list. The top-of-the-line LTZ further offers adaptive cruise control with automatic emergency braking. Other highlights include confident V6 power (in the 2LT and LTZ trims) and outstanding crash-test scores. Of course, big cars are meant to be mile-eaters on the highway, and the Impala delivers here as well, making for a restful, serene road tripper on long hauls. There are a few other sedans you might want to check out before settling on the Impala. The perennial leader of this pack is the roomy Toyota Avalon, which offers a hybrid model in addition to its smooth V6. There are also the well-equipped Hyundai Azera and Kia Cadenza (which share many mechanical bits), as well as the stylish and powerful Chrysler 300. And don’t forget to check out the Hyundai Genesis — it’s a class-up car, but with Hyundai’s aggressive pricing, it may well fall into an Impala shopper’s budget. 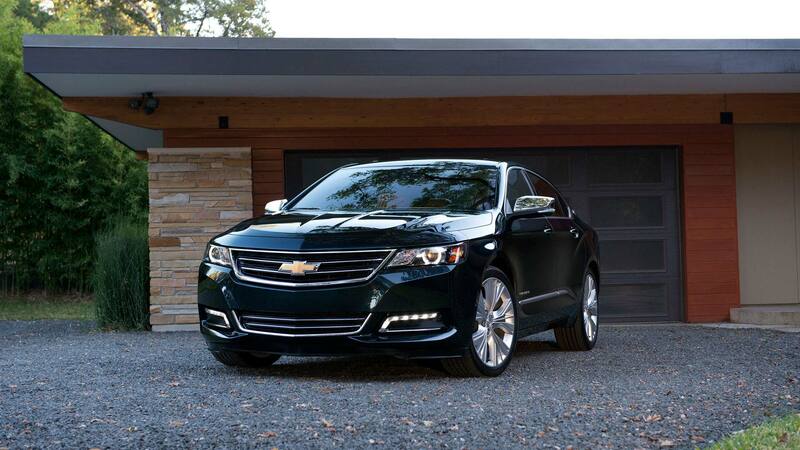 Still, the 2016 Chevrolet Impala is right in the mix and should definitely be on your test-drive list. 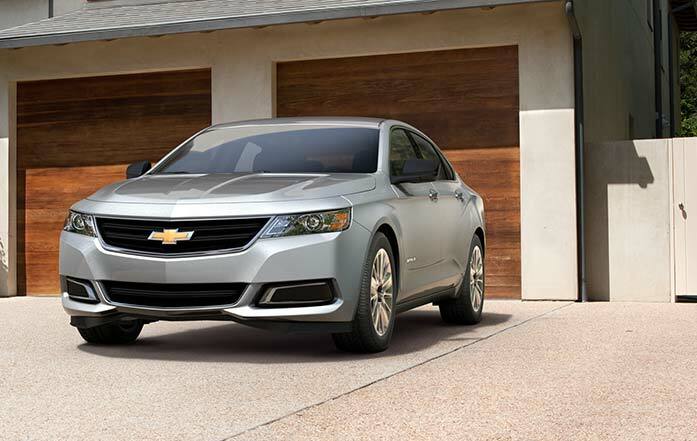 The 2016 Chevrolet Impala is offered in LS, 1LT, 2LT and 2LTZ trim levels. The LS is four-cylinder-only, while the LT comes with either the four (1LT) or the V6 (2LT). The 2LTZ is V6-only. Standard features on the entry-level LS include 18-inch steel wheels, automatic headlights, remote keyless entry, cruise control, air-conditioning, an eight-way power-adjustable driver seat (with power lumbar), a tilt-and-telescoping steering wheel, a trip computer, OnStar (with a 4G connection and WiFi hotspot), Bluetooth phone connectivity and a six-speaker sound system with a CD player, satellite radio, a USB port, an auxiliary audio jack and a 4.2-inch color display. An optional Protection package adds rear parking sensors, foldable rear headrests and a cargo net. Stand-alone options include larger wheels, an engine block heater and all-weather floor mats. The 1LT adds 18-inch alloy wheels, heated side mirrors, cloth-and-leatherette upholstery, dual-zone automatic climate control, a leather-wrapped steering wheel and shift knob, power lumbar adjustment for the front passenger seat, folding rear head restraints and the MyLink infotainment system with an 8-inch touchscreen, voice controls, Bluetooth audio connectivity, two additional USB ports (for a total of three), an SD card slot, HD radio, Apple CarPlay, Internet radio smartphone-app compatibility and voice-to-text messaging capability for certain smartphones. A number of options on the 1LT are grouped into packages. The Convenience package includes rear parking sensors, a rearview camera, remote ignition and an auto-dimming rearview mirror. There are also two Appearance packages, one adding a trunk-lid spoiler, a body-color grille surround and chrome mirror caps, and another (the “Midnight Edition”) adding the spoiler, 19-inch black-and-silver wheels and blacked-out exterior trim. The 2LT is similarly equipped to the 1LT, but substitutes the V6 engine for the 1LT’s four-cylinder. In addition to the 1LT’s options packages, the 2LT offers a Driver Confidence package (forward collision warning, lane-departure warning, blind-spot monitoring with rear cross-traffic alert), a Leather package (leather upholstery, heated front seats, eight-way power passenger seat), a Technology package (19-inch wheels, rear spoiler, 120-volt power outlet, 11-speaker Bose audio system, wireless phone charger, ambient lighting) and a Navigation package (keyless entry and ignition plus integrated MyLink navigation). The 2LTZ model (the number denotes its V6 engine; last year’s four-cylinder version, the 1LTZ, has been dropped) includes the 2LT’s Driver Confidence package and Leather package as standard, as well as the Convenience package (except the auto-dimming rearview mirror), and it adds 19-inch wheels, xenon headlights, dual exhaust outlets, chrome door handles and ambient interior lighting. The 2LTZ’s options list includes an Enhanced Convenience package (auto-dimming driver-side mirror and rearview mirror, ventilated front seats, heated power-adjustable steering wheel, driver memory settings) and an Advanced Technology package (wireless cell phone charging, 11-speaker Bose stereo, 120-volt power outlet). There’s also a Midnight Appearance package like the one offered on the LT models. Adaptive cruise control with automatic emergency braking is exclusively available on the 2LTZ, as are 20-inch wheels. Stand-alone options, depending on trim, include some of the above items within packages, plus a sunroof. Note that a bi-fuel (gasoline or CNG) Impala is also slated for production in familiar LS and LT (technically “3LT”) trims, though it has slightly different equipment, including standard single-zone automatic climate control for the LS and a mildly modified options structure. All 2016 Impalas are equipped with a six-speed automatic transmission and front-wheel drive. The LS and 1LT employ a 2.5-liter four-cylinder engine rated at 196 horsepower and 186 pound-feet of torque. Fuel economy is EPA-rated at 25 mpg combined (22 city/31 highway). Included with the four-cylinder is an automatic stop-start system that automatically shuts off the engine when you come to a halt to save fuel. The 2LT and 2LTZ step up to a 3.6-liter V6 rated at 305 hp and 264 lb-ft of torque. The EPA rates this engine at 22 mpg combined (18 city/28 highway). In Edmunds performance testing, a 2015 Impala 2LT accelerated from zero to 60 mph in a quicker-than-average 6.4 seconds, putting it in a dead heat with the last Avalon we tested and comfortably ahead of the Azera and Cadenza. Chevrolet also plans to offer a dual-fuel Impala V6 that can run on either compressed natural gas (CNG) or gasoline. The trunk-mounted CNG tank holds 7.8 GGE (gasoline gallon equivalent), enough to power the Impala for 150 miles. The bi-fuel Impala runs on CNG by default, switching over to gasoline when the CNG tank is depleted, but a dash-mounted switch allows you to change fuel sources on the fly. The engine produces 260 hp and 247 lb-ft on gasoline, dropping to 230 hp and 218 lb-ft on CNG. According to the EPA, fuel economy suffers somewhat — the bi-fuel Impala is EPA-rated at 20 mpg combined (17 city/25 highway) on gasoline and 19 mpg combined (16/24) on CNG. The 2016 Chevrolet Impala comes standard with antilock brakes, traction and stability control, front-seat side airbags, full-length side curtain airbags and front knee airbags. Also standard is GM’s subscription-based OnStar service, which includes automatic crash notification, an emergency assistance button, remote door unlock and stolen vehicle assistance. The 1LT’s Convenience package includes rear parking sensors and a rearview camera, while the 2LT’s Driver Confidence package (standard on 2LTZ) adds forward collision warning, lane-departure warning and blind-spot monitoring with rear cross-traffic alert. The 2LTZ gets an exclusive forward collision mitigation system with automatic braking when adaptive cruise control is specified. In Edmunds brake testing, a 2015 Impala 2LT with 19-inch wheels came to a stop from 60 mph in 114 feet, an excellent result for the segment. The Impala’s dynamic, modern exterior writes checks that its interior is pleased to cash. The graceful dual-cowl dashboard flows organically into the door panels, creating a wraparound effect that has become a GM trademark as of late. The 8-inch MyLink touchscreen for audio, navigation and phone functions really ties the room together, providing crisp, high-resolution graphics (except for the oddly grainy rearview) and an intuitive interface that works much like a smartphone. We would ask only for quicker and more predictable responses to touch inputs, as well as upgraded materials to replace a few flimsy plastic elements in the center console. A generous wheelbase gives the Impala serious passenger space front and rear. Four 6-footers could do a cross-country road trip in perfect comfort, which is precisely what we expect from a large sedan. The wide, plush seats offer a variety of upholstery options, including cloth, a cloth/leatherette combination and leather. The standard 60/40-split folding rear seatbacks add useful additional cargo space to the already ample 18.8-cubic-foot trunk. Impala buyers might be tempted to stick with the four-cylinder engine on account of its lower price and higher fuel economy, but if you shell out for the V6, you won’t regret it. The V6’s relatively swift sprint to 60 mph only tells part of the story — when you punch it at cruising speed, the engine responds with real authority. As for the base four, it’s reasonably smooth and willing, but its 110-hp deficit is readily apparent from the driver seat. As expected, the Impala takes road impacts in stride, soaking up the bumps and ruts like a big car should. The interior is also pleasingly quiet, with minimal amounts of wind and road noise at freeway speeds. For maximum ride comfort, however, we advise skipping the 2LTZ’s optional 20-inch wheels, as they ride a little too harshly over sharp bumps. 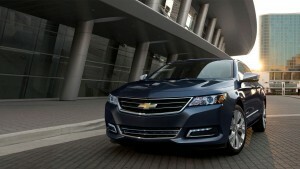 Taken around turns, the Impala demonstrates modest handling limits that don’t quite jibe with the car’s sleek styling. 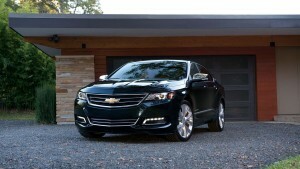 In the absence of sporting performance, though, the Impala still provides a secure feel on winding roads.